I am responsible for every graphic that goes into our videos from pre-production to post-production processes. I work with the video and content teams to assemble graphic packages that range from the simplest lower third credential over footage to full graphic videos, adding to our library of over 11,000 videos! Occasionally I assist Marketing with animations such as creating introduction graphics for the weekly challenge videos. Recently I’ve taken a larger role in our nutrition based content. I am spearheading a video series called "Quick Recipes". I get to be on set for these short video shoots to help ensure filming shots will fit seamlessly with the graphics. After they are published to the site, I check these videos weekly to answer visitor questions (my BodySpace username is emilymacke). A typical day starts with a protein shake, catching up on emails, and going through any final reviews that need to be done. I usually prioritize my day based on production calendars and schedules. Then, I will either work on new concepts or continue to create graphics that have been templated and approved. Often I spend my time going through every video and determining where graphics need to be placed based on the video editors’ timelines. There’s also a lot of back and forth with the writers to ensure our article copy synchs with the graphics. As part of the Digital Publishing team I feel a great responsibility to produce information and content that’s accurate and easy for our visitors to understand. Every video piece, article, exercise guide, or training program we are creating helps someone, somewhere. Our huge library of content is absolutely changing lives and I love being able to play a role in it! From left to right: a visit from emily's parents in her new idaho backyard. Emily with her boyfriend kurt on a skiing trip. I MAKE GRAPHICS. Just kidding: Creative, subjective, evolving. 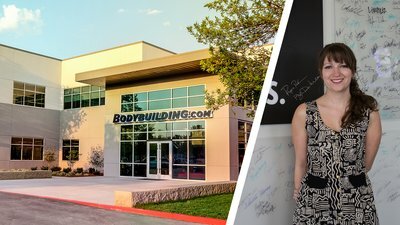 Tell Us What It Takes To Work At Bodybuilding.com? To work here you really need to be a passionate individual. When you’re working on a project like the Jesse Shand transformation story, you know that someone might make a connection that could change their life forever. That is what keeps me at my desk until the work gets done. You should also have the desire to be better than you were yesterday to work here. The dazzling ladies of the digital publishing group enjoy lunch together. What Is Your Favorite Perk Or Aspect Of Company Culture? I LOVE movie nights in the backyard. My boyfriend and I have been to every single one and always have a great time. It’s fun meeting up with great coworkers, hanging out on a bunch of picnic blankets with movie theater candy, and watching The Goonies. I moved to Boise from Cincinnati, Ohio so I had a lot of new friendships to build. These people have become my best friends. I spend my weekends with them and take care of their plants and dogs when they go on vacation. I’ve cried in front of them and shared lots of laughs. The people I’ve met here are just fantastic people to be around. I mean who else has Nerf Gun wars for a team building activity? Nerf gun challenges keep team building interesting and silly. Right now I’m super motivated to stay on track because I’m in a wedding in June! And this might be cheesy, but my brain is a huge motivation to stay on track with my fitness. Stress and cortisol literally shrinks your brain and unfortunately I’m a very high-strung person. I put a lot into everything I do, so I make it a priority to stay active and drop my stress levels. Do You Have A Favorite Sport, Fitness Program, Or Bbcom Trainer? When I’m at the gym I always look to Lee Labrada’s Lean Body Trainer. The workouts are really perfect for me and I like the split. I also love Zumba! Classes are offered through work and it’s a fun way to get some cardio in without running. My secret hobby is special effects makeup. I love to play around and see what I can create. I’ve been hired before to do makeup for zombie walks, music videos, photo shoots, etc. It’s cool to see someone look in the mirror for the first time after doing their makeup and seeing their reaction. This past Halloween I dressed as a Roy Lichtenstein painting and painted my whole face to look like a pop art character. I also love to bake goodies; I’ll whip something up cake related at least once a week. Emily's artistic pop-art makeup and costume inspired by roy lichtenstein. What Is The Funniest Thing You Have Seen At Work? I will never forget the time that we played frisbee in the backyard for the first time of the season last year. Everyone on the Video Team was outside and so excited to get it going. There were a few throws happening while we were all getting into position, but on the first real throw, the frisbee caught the breeze and went sailing...right onto the roof. It was simultaneously hilarious and really depressing. We had a great laugh, went back inside, and demanded that the thrower buy us another frisbee. Thanks Emily! We Are Happy To Have You At Bodybuilding.com!